Windows provides some very helpful tips and messages through tool tips (the messages that pop up when you hover the mouse pointer over an icon) and dialog boxes. Do you wish to replace those messages with your own peppy comments? That is what I'm going to show you today. Most of the Windows messages and dialog boxes that you see can be found inside two executable files - the explorer.exe and shell32.dll. By tweaking these files we can control how Windows looks and what messages it display. For this, we will use a tool called Resource Hacker. Resource Hacker is an extremely useful piece of software that can view, modify, rename, add, delete and extract resources in any executable files. At first, make a copy of explorer.exe from C:\Windows folder. We will make modification to this copied file and when it is done replace the original file with our customized one. 300, "Opens the My Documents folder, where you can store letters, reports, notes, and other kinds of documents." 301, "Displays recently opened documents and folders." 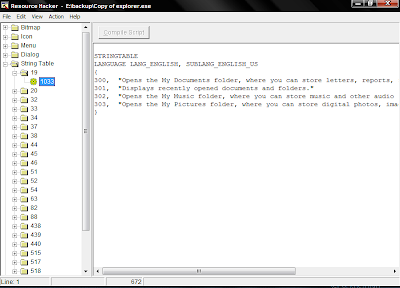 302, "Opens the My Music folder, where you can store music and other audio files." 303, "Opens the My Pictures folder, where you can store digital photos, images, and graphics files." You can immediately recognize what those messages refer to. String no 300 is the tool tip that pops up when you hover the mouse cursor over the My Documents folder. String 301 is for the Recent Documents folder. You can figure out the rest yourself. Change the string to anything you like and then click Compile Script. Each of the folders under String Table contains such strings that you can modify at will. Just make sure you don't mess up those messages so that later you know what each one of them actually means. Here are some places where you can find some common tool tips. To change the messages shown in the dialog boxes we will have to edit shell32.dll. Make a copy of C:\Windows\System32\shell32.dll just like we did previously before you start modifying. Take your time and explore the various folders under the String Table. You will find lots of strings to edit. Don't forget to compile after you have finished. Actually, there is a lot more you can do than edit the strings. The folder Bitmap contains various images that are displayed in Explorer and dialog boxes. The folder Icons contain all the icons used by Windows. You can change them as well. The second step of this process is to replace the original files with the modified ones. 1. First move the new files to a handy location. Let us move them to the root of the C drive. 2. Put the Windows XP installation disk on the CD drive and restart the computer. 3. After the computer boots and prepares itself for installation you will be asked whether you want to go to the Recovery Console. Press R to enter the Recovery Console. 4. Select the Windows installation by pressing the appropriate number key (this is usually 1 unless you have more than one Windows installation). Type the administrator password, if any. The commands are self explanatory. Type Exit to restart the computer. Do not delete the backup files (explorer.bak and shel32.bak) if you wish to revert back to the original condition of Windows. Happy tweaking. Is it possible to show a bitmap within the context of the tooltip? I realize the sytax I've employed in incorrect but Im more interested in whether an image can be displayed within the tooltip window? @Jon: I'm afraid it's not possible. The tooltip is not programmed to display images so there is no direct way of doing it. If there is any way then it would involve a lot more tweaking and changing the behaviour of the tooltip, which is I'm not aware of. IS there any way to add Rename button in the "Confirm file replace" dialog? @Mario: No, the Rename option is not there in Confirm file replace dialog box, and I'm not sure if there is any way to add it. How can i put a tip for each project folder in a new folder structure we are employing so that for each folder there is a description of what would go into those folders as you hover over folder icon? Typeface can be changed from the desktop properties. Right-click on the desktop, select Properties.